So, the mud is up to your knees, greys have become bays and the winter seems endless! It’s probably the most difficult time of year for any horse owner, having to have the daily battle against all the elements just to turn your horse out. So here are a few tips I find to make stable management a little easier and make the most of these last winter months. It’s hard to remember the last time I came back from the field not weighing another twenty pounds due to all the mud clinging to my boots! And the horses are much the same when it comes to the mud clinging to their hooves. It’s a very simple solution to the problem but it prevents a lot of unnecessary hassle in the long run. Wash their legs and hooves off when bringing them in and pick out their feet. Simple yet effective. Washing off their legs and hooves allow for me to inspect their legs for any cuts or abnormalities. However, the most effective part of this process I find is allowing their feet to fully dry after. This stops their hooves become soft and cracking in the long run. 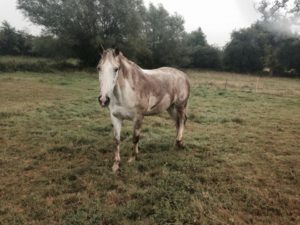 Having had a horse suffer with mud fever I can understand why a lot people disagree with washing their legs off daily, as the wet is the perfect condition for the mud fever to spread, however I found anti-mud fever products and the right management it cleared up fine and he’s never suffered with it since. So, having cleaning off their legs I’m left to battle the rest of the mud plastered to them. It can be a real challenge to keep the mud off them and once it’s one it can be even more difficult to get it off. I would recommend to anyone (especially those with greys) trying to keep horses clean investing in an equine hood. It has saved me hours of grooming. The hood coupled with a big rug fights off most of the mud but not all of it. The only way I’ve found to keep them clean is just regular grooming. Having said this the mud that clings to their rugs can be even more of annoyance! Both my horses are equipped with lovely big winter rugs and I’d like to emphasize the word big here! They are huge and heavy before the mud adds to the weight. So as winter drags on their rugs become heavier and heavier until I’m struggling to put them on due to there, now, enormous weight! A friend suggested a very simple solution to this problem. I’ve since tried this, and my life has become massively easier. I put a very thin water proof sheet over the top of the winter rug and this light weight sheet takes on most the mud as both my horses wallow in the mud. Making it so much easier to take on and off with both rugs. I must stress though not to over rug horses and manage their body temperature according to each horse and the weather. It also makes the cleaning bill cheaper and they’re also much cheaper to replace/repair in the event of damage. The outdoor rugs are of course only half the battle in the winter with my horses as they spend 50% of their time in the stable. I have a beautiful grey horse that spends most of his time turning himself into a skewbald. Much of this is achieved in the stable with fantastic poo stains. Having just clipped him rugs are essentials so now his stable rugs are in one-word disgusting. However, the they do stop the poo stains (well, certainly reduce them) on him. But I had to find a way of stopping his rugs becoming so disgusting that even he’d refuse to wear them. Much like with field rotation, to stop fields becoming over used, I rotate his rugs. Again, I use layers of thinner rugs and he has duplicates of them. These thin rugs are easier to wash and whilst their being washed the others are being used. A continuous cycle throughout the winter months. It may still be winter, but I find starting the spring cleaning now makes life so much easier when the weather starts to change again. So, it’s been a very wet and muddy winter, we’ve had all sorts of weather thrown at us and my tack room is a mess of discarded bits of old or broken equine equipment. Having had Christmas, I’ve been very lucky and been gifted lots of new equestrian equipment. But it’s time to get rid of my old stuff to make more room. Much of it just needs a clean and I can pop together a classified ad to sell in on an equestrian website. The rest of it is too broken to be used so they’ll have to be thrown away. Also, all my tack and riding boots could do with a good clean with a leather cleaning product to stop the leather cracking and to keep it in a good condition. I continue with my spring clean but with less cleaning and more organisation. My horses seem to have more rugs than I do clothes, making it very difficult to store them all. However, I split them into winter and summer rugs, storing one half whilst the other is being used and then rotating as the seasons change. Despite them not wearing them yet I like to know where all their summer rugs are, and I start to get them out ready for when the weather changes. As well as doing this I start to put some of their less used winter rugs away or send them off for cleaning and repairs ready for next winter. Having done all this I go about and clean the yard where I can, organising grooming kits, bits, boots, head collars, random bits of baler-twine etc. 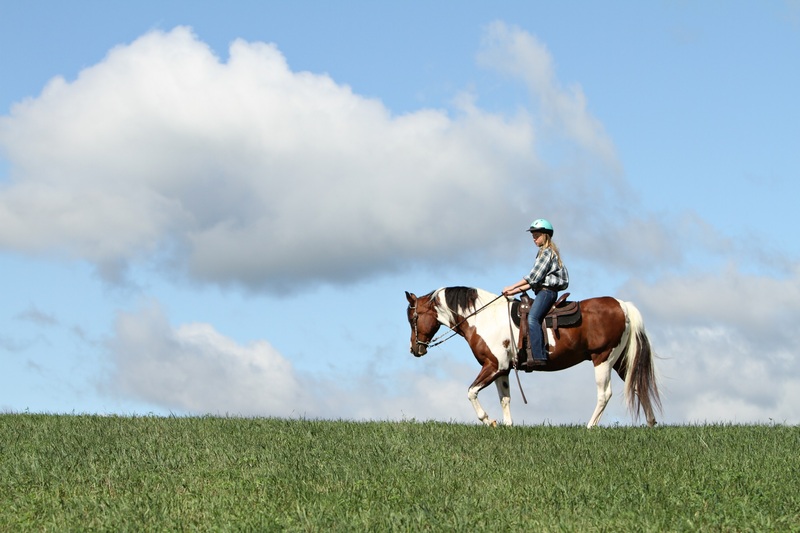 It makes it all the easier come the spring and I can spend more time enjoying time with my horses in the nicer weather. These are all very simple solutions, but I find they make my life at the stables much easier.